Thanks for attending Predictive Analytics World San Francisco 2013, we can't wait to see you again in 2014. 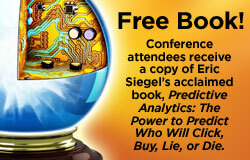 "Predictive Analytics World did a great job keeping up with the trends in Predictive Modeling. There were also plenty of opportunities to learn about the most valuable resources available to data scientists. " "People who are in analytics must join Predictive Analytics World; and see state of the art projects, it is more than science, including art.."
"This vendor neutral conference always gives me tangible ideas I can put to work right away." PAW San Francisco's agenda covers hot topics and advanced methods such as advanced methods, analytics team building & management, blackbox trading, brand analytics, churn modeling, cross-enterprise analytics, crowdsourcing predictive analytics, data visualization, e-commerce analytics, financial services, fraud detection, healthcare analytics, HR analytics, industry skills, insurance, lead management, likelihood-to-recommend, next best offer, open question answering (Watson), search engine marketing, social data, spam detection, survey analysis, telecom applications, uplift modeling, and other innovative applications that benefit organizations in new and creative ways.